The popularity of Australian plants has increased and they are grown all over the world, from the UK to North Africa and Japan to Singapore. The Landscaping with Australian Plants ebook shows you possibilities of differentiating your landscaping options and using Australian plants, something that you might not have even considered using where you live. There are a wide range of plants that grow in different climates and can be useful and very nice to look at. There are many purposeful ways that Australian plants can be used in the garden regardless of the garden style. They may be used to create barriers against wind, sun, or fire, or to block out unsightly views and to frame vistas. 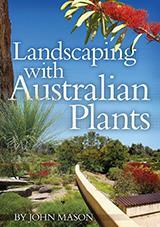 Written by John Mason and staff of ACS Distance Education, the Landscaping with Australian Plants ebook is 197 pages that will change your perspective on using Australian native plants within your landscape and garden design. What is a natural, wild or bush garden?